Born in Paris in December 1859, Seurat had scant contact with his distant father but formed a close attachment with his mother who appears in several drawings. Much later he would continue to take his evening meal with his mother at her apartment on the Boulevard Magenta even when he was living close by with his mistress. Although he may not have had a close relationship with his father, who lived in Le Raincy, outside Paris, he experienced no paternal opposition to his chosen life as an artist. Indeed he received financial support from his father (who had made money through property speculation) which relieved him from financial concerns and effectively freed him from the need to sell his paintings. Seurat seems to have inherited a sense of middle class respectability and reserve from his parents – Paul Signac wrote that he was ‘very reserved’ and that he ‘hid his life’. His first formal training was at the local municipal art school which was principally concerned with turning out apprentices for industrial design. In February 1878 Seurat was accepted as a student at the École des Beaux-Arts where he studied under Henri Lehmann, an admirer of Ingres, who set his students to work drawing from plaster casts of classical sculptures. Seurat did not find this highly conservative regime to his taste and he was soon seeking inspiration elsewhere; he spent a lot of time in the Louvre where he studied the work of Delacroix and Rubens among others. He also attended the studio of the less formal and highly influential Pierre Puvis de Chavannes. In April 1879 Seurat visited the Fourth Impressionist Exhibition which was a profound revelation – he was especially impressed with the work of Monet and Pissarro. In November that year Seurat was conscripted for one year’s national service and stationed in Brest, the base for France’s Atlantic Fleet. However his enforced stay in Brittany was not wasted – he made use of any spare time to read a number of articles published in the periodical L’Art by David Sutter collectively entitled Les phénomènes de la vision – he was particularly interested in the articles which looked at Greek Art. 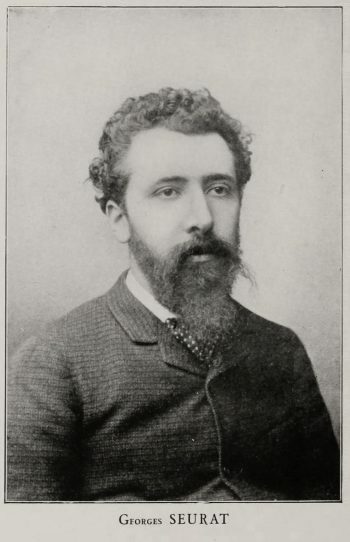 On his return to Paris the thought of returning to the plaster casts of the École des Beaux-Arts was out of the question so Seurat continued his personal quest for enlightenment by reading the academic literature concerning colour theory, optics, chemistry and other scientific disciplines. In 1882, Seurat rented a studio in the rue Chabrol and it was here that in 1883 he started work on Bathers at Asnières, the fruit of his extensive research over several years. Tragically, Seurat died aged thirty-one only eight years later. In his short career he was responsible for the development of the innovative painting technique which he called chromo-luminarism but which came to be known as Neo-impressionism, Pointillism or Divisionism. This technique was informed by a number of scientific theories developed during the 19th century relating to colour, optics and psychology which had gained credence within Post-impressionist and Symbolist circles during the latter part of the century. Essentially Seurat took these ideas and created his own response, which was to work with small juxtaposed dabs (or points) of pure but complementary colour so that, when viewed from a distance, the tiny strokes mix within the viewer’s eye to give the impression of another colour. 1884 Bathers at Asnières is rejected by the Salon but the painting is shown at the first exhibition of the Salon des Artistes Indépendants. 1886 Seurat exhibits various works at the Eighth (and last) Impressionist Exhibition, chief among them the huge A Sunday on the Island of La Grande Jatte, which is again exhibited later in the same year at the second Salon des Artistes Indépendants. Paints at Honfleur in the summer. 1890 Seurat’s mistress Madeleine Knobloch gives birth to their son. Few of his associates are aware of their relationship. Works at Gravelines in the summer.